Infectious diseases have been a major cause of mortality historically. However, developments within medicine and public health during the 20th century helped to markedly reduce the burden associated with infectious diseases. In 1900, infectious diseases accounted for one-third of all deaths out of the top 10 leading causes of death. On the contrary, in 2014, noncommunicable diseases such as cardiovascular illness and cancers accounted for the majority of deaths. Key medical breakthroughs, such as the discovery of penicillin, as well as improved sanitation played crucial roles in reducing the mortality associated with infections. Fleming's discovery of penicillin heralded in the “golden era” of antibiotic development, during which many new antibiotics were developed and introduced, causing many to believe that infectious diseases would soon be conquered. However, infectious diseases are again on the rise, especially those which can no longer be treated using the previously discovered antibiotics. Infectious pathogens are able to evolve and therefore over time, many have developed resistance to the currently-prescribed and newly-developed antibiotics. In fact, antibiotic resistance has become a significant threat to the health of individuals at the global level. Methicillin-resistant Staphylococcus aureus (MRSA) kills nearly 50,000 individuals every year in the United States and Europe alone, with many more dying from it in other settings. Antibiotic-resistant diseases such as tuberculosis (TB) have significant impacts on developing countries. In 2013, there were approximately 480,000 cases of multidrug-resistant TB. Since both developed and developing countries are equally affected by antibiotic-resistant infections, it is important to analyze antibiotic resistance development globally. Although it is difficult to get accurate estimates of drug resistance, it is predicted that antimicrobial-resistant infections will lead to nearly 10 million deaths per year by 2050 and a total GDP loss of $100.2 trillion by 2050 if appropriate actions are not taken. Since infectious pathogens are constantly evolving and developing antibiotic resistance, it is essential to examine the key socioeconomic and political factors which contribute to the rise in the prevalence of antibiotic resistance in developing and developed nations. The purpose of this study was to conduct a qualitative literature review of the various factors contributing to the rise in antibiotic resistance globally. This paper aims to highlight that there are distinct factors which play a role in increasing the prevalence of antibiotic resistance in developing and developed countries and argues that more measures need to be taken at international and national levels to improve the regulatory framework to slow the development of antibiotic resistance and augment research into novel therapies. PUBMED was used to identify primary research, systematic reviews, and narrative reviews published between 1963 and January 2017. Search terms included antibiotic resistance, antimicrobial resistance, superbugs, multidrug-resistant organisms, developing countries, developed countries. Publications from different countries were included to ensure generalizability. Publications were excluded if they did not mention factors causing resistance, focused on the molecular basis of resistance, or if they were case reports. Publications in languages other than English were also excluded. Publicly available reports from national and international health agencies were used. Search results yielded 2281 publications for developing nations and 1227 publications for developed nations. Publications were screened based on their titles and abstracts. Case reports as well as publications which did not focus on socioeconomic and political contributors to antibiotic resistance were excluded. Finally, 18 publications from developing nations and 13 publications from developed nations were included in the review. In addition, six publicly available reports from the World Health Organization (WHO), Centers of Disease Control, and the Food and Drug Administration (FDA) were utilized [Figure 1]. In developing nations, key contributors identified included: (1) Lack of surveillance of resistance development, (2) poor quality control of available antibiotics, (3) clinical misuse, and (4) ease of availability. In contrast, in developed countries, factors contributing to antibiotic resistance included: (1) poor hospital-level regulation and (2) overuse of antibiotics in food-producing animals. Finally, there is a significant lack of research on new antibiotics, which affects both developing and developed nations [Figure 2]. Each of these factors will be discussed in more detail in the subsequent sections. While it is essential to maintain proper surveillance of antibiotic resistance development, in most developing countries, there is little to no such surveillance. In 2014, the WHO released the first report on antimicrobial resistance, in which the WHO collected national data on nine bacterial infections/antibiotic combinations of greatest concern for global health. The data revealed that out of 194 countries, only 129 provided data, of which only 22 had data on all nine infection-antibiotic resistance combinations deemed to be emerging global threats., The 2014 WHO report was the first attempt to obtain a more comprehensive analysis of the extent of worldwide antimicrobial resistance. The report not only highlighted the high levels of antibiotic resistance globally but also the lack of coordination and significant gaps in surveillance, especially in many of the developing countries with high burden of antibiotic resistance from where no national data was obtained. In order to narrow the gaps in surveillance, the WHO has since launched the Global AMR surveillance system (GLASS), in which more than one-fourth of the WHO member states have been enrolled until December 2017. Currently, there are still many limitations, especially in the developing countries where resources and proper infrastructure are necessary to improve surveillance of antimicrobial resistance development. Many developing countries do not have the necessary quality assurance mechanisms to ensure that antibiotics being supplied are high quality. A 2006 Nigerian study showed that nearly 25%–40% of ampicillin/cloxacillin antibiotic formulations were substandard. It has also been shown that the use of expired pediatric antibiotics led to higher rates of resistance when compared to unexpired medicines. Resistance rates are in fact increased by 2–6 fold when using expired medications compared to unexpired medications. Substandard and expired antibiotics are sold for a number of reasons. The expiration date printed gives consumers information about the shelf life of a medicine given that it is stored in proper conditions of light, temperature, and moisture. However, high temperatures, harsh sunlight, and humidity can all lead to antibiotic degradation. If the actual medicine storage and transport conditions deviate from the recommended ones, then it is possible that a larger than expected percentage of medicines are degraded, catching both health-care workers and the patient unaware that the patient is receiving a subtherapeutic dose. The tropical conditions in some of the developing nations in addition to a lack of attention on proper transport methods affect the quality of the antibiotics. Many medications also get relabeled near the end of their shelf life and get donated rather than sold., Finally, counterfeit drugs, in which there is little to no active ingredient, are also sold and can lead to increases in development of drug resistance. All of these facts underscore the need to improve quality assurance and enforcement of the antibiotic good manufacturing practice globally. Clinical misdiagnosis and antibiotic misuse also contribute to antibiotic resistance due to the excessive use of antibiotics when not clinically indicated. It has been shown that proper diagnostic methods are often not utilized when treating infections and therefore antibiotics are prescribed when not necessary. A study in a Chinese University hospital highlighted that of 1025 cases where antibiotics are prescribed, only 39 had a microbiological examination done to identify the source of the infection. The same study showed that nearly 77.8% of patients were prescribed 1 or more antibiotics. Similarly, in Jakarta, Indonesia, 94% of children with diarrhea were prescribed antibiotics despite most physicians suspected it to be a viral infection. There has been significant work done by the WHO to create international standards toward improving clinical diagnosis for TB. Despite these efforts, there has been little use and availability of these new diagnostic tools. Molecular tests such as the GeneXpert are recommended for TB diagnosis. However, in India, this test is recommended only for HIV-associated TB and multidrug-resistant TB rather than for all TB cases primarily due to the cost of these tests. Similarly, the use of these molecular tests is either not implemented or partially implemented in most developing nations. While the use of drug sensitivity tests is currently recommended for any patient with a history of previous anti-TB treatment, positive smear test after 3 months of treatment, or treatment failure/relapse, only 39% of providers performed a drug sensitivity test for such cases according to a study in India. Microbiological bacterial culture and drug sensitivity tests are rarely done in many developing countries. Other diagnostic tests used to confirm infection are uncommon and unreliable, and therefore, many clinicians only rely on clinical signs and symptoms rather than the recommended laboratory tests. Consequently, there is an increased use of broad-spectrum antibiotics, which in turn breeds resistance because it selects for resistant organisms within the normal intestinal flora which may be harmless at index antibiotic administration but can transfer resistance to future pathogenic infections. As a result, the lack of proper diagnostic methods can lead to increases in drug resistance. Studies have also shown that clinical misuse of antibiotics is more common among private practitioners than those in the public sector., A retrospective analysis of the antibiotic prescribing practices in Malaysia showed that while in public clinics the antibiotic prescribing rate was 6.8%, in private settings the antibiotic prescribing rate was 30.8%. While the WHO has developed the directly observed treatment, short-course (DOTS) TB treatment guidelines according to the level of drug resistance, studies in India have found that most private treatments were irrational and not compliant with these recommendations. A 2010 study from Mumbai, India, found that when 106 private practitioners were asked to write a prescription for a patient with pulmonary TB, 63 different drug regimens were prescribed and only 6 of those were appropriate. Since some physicians depend on both patients' fees and the kickbacks they receive from the pharmaceutical industry, there is little incentive to join and adhere to the nationwide DOTS program. The unregulated private sector leads to improper diagnostic and prescribing practices which in turn contributes to selection for resistant organisms and lead to increasing antibiotic resistance. In most developing countries, there is little regulation on the retail of pharmaceuticals. The ease of availability of antibiotics is probably one of the biggest contributors to antibiotic resistance. Antibiotics are available often without a physician's prescription, contributing to the overuse of antibiotics due to self-medications and prescriptions by unskilled health workers. In Minya, Egypt, a study of antibiotic use showed that 81% of pharmacists prescribe antibiotics for colds. In many countries in Asia, Africa, and Latin America, antibiotics are readily available from local pharmacies, hospitals, drugstores, roadside stalls, and hawkers without a prescription. In rural Bangladesh, a study of 2000 participants showed that 95% of the medications consumed came from local pharmacies, and only 8% of these were prescribed by physicians. A similar study was done to identify drug dispensing patterns to standardized TB patients in India who visited 623 pharmacies in three major cities. While in confirmed TB cases 61% of patients were ideally managed and referred to a health-care center without drug dispensing, in presumptive cases only 13% of the patients were managed in this way. These number may be drastically different in rural settings where high illiteracy rates and unqualified pharmacists may compound the problem. While steps are being taken to improve regulations in many countries including India, there are still many milestones to be achieved. In many developing countries and especially in rural areas, there is a lack of available skilled doctors and health workers who are certified to diagnose and treat ailments. As a result, many unskilled health workers with minimal training as well as traditional healers treat ailments and prescribe antibiotics. A study in rural India on childhood diarrhea and pneumonia showed that out of 340 health-care practitioners included in the study, 80 of them had no formal education., In addition, the study showed that unqualified practitioners were more likely to prescribe harmful treatments. Unskilled health workers and healers often have little to no understanding of the consequences of unregulated antibiotic use. The issue of antibiotic resistance is not limited to developing nations. Even industrialized countries face the global threat of drug-resistant infections. In many high- and middle-income countries, prophylactic antibiotics are used extensively for common procedures such as cesarean sections, joint replacements, and organ transplants. Antibiotics are also given prophylactically to patients undergoing chemotherapy, which lowers immunity. Finally, intercontinental travel has become very common now and therefore increases the speed and extent of spread of drug-resistant pathogens, making antibiotic resistance an equally significant public health threat in developed countries. Thus, it is important to analyze the socioeconomic driving forces behind antibiotic resistance development in high-income industrialized nations. Similar factors as those in the developing nations play a role in breeding drug resistance in the United States, including inappropriate prescribing practices by clinicians and poor patient compliance. Many uninsured individuals and those living below the poverty line get antibiotics from unreliable sources within the United States or from foreign countries. In 2003, out of 1153 shipments arriving in Miami, New York, and California, nearly 88% of these shipments contained unapproved medications from various countries. Many individuals, of whom nearly 80% were uninsured, frequently visit Mexico to get access to antibiotics readily without needing a prescription., In addition to improper imports, self-medication is also a significant problem in industrialized countries. A prospective survey conducted in an emergency department of a hospital showed that nearly 17% of the patients took “left-over” medications when they experienced a cough or sore throat., Sharing of medications is also common in which patients use “left-over” antibiotics initially prescribed to other individuals. However, while similar factors such as the ease of availability of antibiotics from unreliable sources are also present in industrialized countries, there are other distinct factors which play a much greater role in contributing to resistance development in these countries. Hospital-acquired infections (nosocomial infections) remain one of the major sources of antibiotic-resistant infections in developed countries. Antibiotics are used extensively in hospitals to not just treat patients with bacterial infectious diseases but also prophylactically to reduce risk of infections during procedures and surgeries. The excessive use of antibiotics coupled with close patient–patient interactions and the need for increased hygiene and sanitation within hospitals play a significant role in development and transmission of drug-resistant bacterial infections. Statistics show that rates of resistance in nosocomial infections have been rising and the primary driving factors include the unregulated overuse of antibiotics and cross-transmission between patients, which is often due to infrequent handwashing and hand gloving. However, increasing regulations within hospitals have proven to be successful in reducing the burden of hospital-associated infections, especially for drug-resistant infections. Many hospitals have adopted policies requiring health-care workers to frequently wash hands in between different patients, installed alcohol-based hand rubs outside of patient rooms, and requiring universal gloving during all patient interactions. While these interventions lower cross-transmission of already resistant organisms, they do not affect the rate of development of antibiotic resistance which occurs due to inappropriate antibiotic prescribing practices. It has been shown that hospital-level monitoring and restrictions on antibiotic use have been the most useful to improve antibiotic prescribing practices. Many hospitals have begun antimicrobial stewardship programs consisting of interdisciplinary teams to monitor antimicrobial use and identify ways to reduce development and transmission of drug resistance. 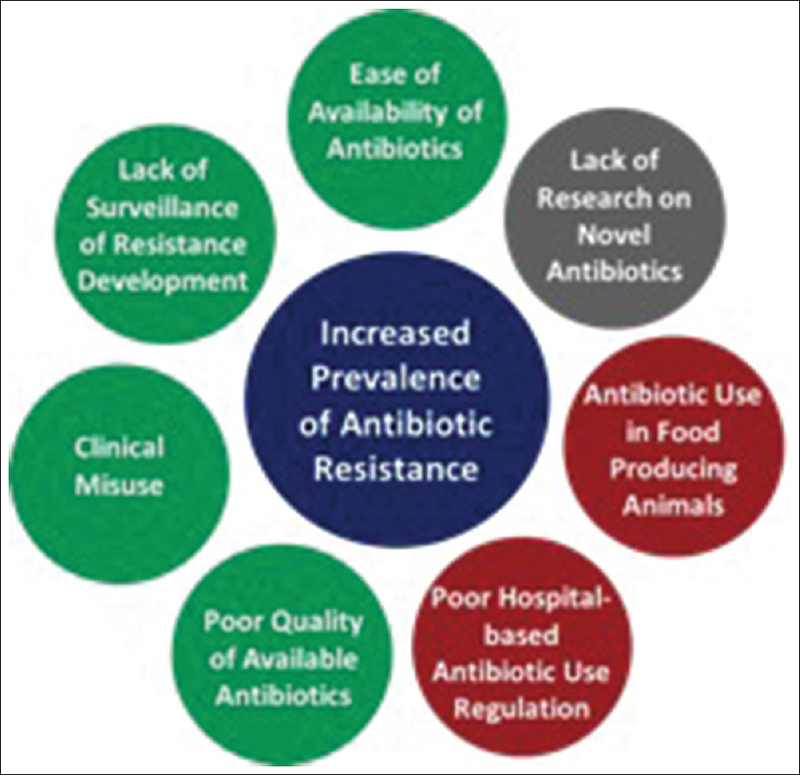 Some of the ways to lower resistance development include limiting prescribing options to one or two antibiotics per class, regularly providing feedback to doctors after their antibiotic prescriptions, as well as utilizing a decision-support algorithm to provide patient-specific laboratory results and local resistance patterns., Similarly, it has been found that rotating the drug being used within a specific class of antibiotics can also help reduce incidences of resistance development as it relieves selective pressure on the organisms by a single antimicrobial agent., A systematic review of the various studies done on the effectiveness of antimicrobial stewardship programs shows that such initiatives are associated with reductions in antimicrobial use, shorter duration of antibiotic therapy, less clinical misuse, and fewer adverse reactions. In addition, it also shows that antimicrobial stewardship programs longer than 6 months are also associated with reduced development of drug resistance though that depends on the specific pathogen and antibiotic being used. Overall, the effects of antimicrobial stewardship programs also highlight the key role effective regulations and policy enforcement play in reducing the burden of antibiotic resistance. However, while many hospitals have adopted such a strategy, data from 2014 shows that only 39.2% of US hospitals have an antimicrobial stewardship program. In fact, in several regions of the country, only 7%–28% of hospitals have similar programs to lower hospital-associated infections and antibiotic resistance. Another area which has been debated as being one of the contributors to antibiotic-resistant infections includes the use of antibiotics in food-producing animals. In order to understand the role of antibiotic use in food-producing animals, it is first important to understand the extent of antibiotic use in animals as well as the complex interactions between different components which lead to antibiotic resistance in humans. Antibiotics are not only used to treat diseases in animals but also prophylactically to prevent infections and nontherapeutically to increase animal growth. Many of these uses often overlap and are used simultaneously in livestock. A 2013 FDA report highlights the extent to which antimicrobials are used in food-producing animals. Data reveal that the sales of antimicrobials increased by nearly 26% from 2009 to 2015. In addition, in 2016, 96% of antimicrobials for medical and nonmedical use were sold over-the-counter without needing a veterinary prescription; nearly 7–9 million medically important drugs and 4–6 million nonmedically important drugs were sold annually for use in food-producing animals since 2009, in which medically important drugs refer to the FDA's guidelines for industry use of medications important for human medical therapy. These statistics illustrate the extent of antimicrobial use in animals without any veterinary regulation. The complex web of interactions between humans and animals eventually lead to transmission of infectious agents and antibiotic resistance into human pathogens. Antibiotic use in food-producing animals can have both direct and indirect consequences for human health. For instance, consumption of meat products contaminated with antibiotic-resistant pathogens can lead to outbreaks of resistant diseases. It can also increase colonization of resistant bacteria and therefore induce resistance in the normal flora of the gastrointestinal tract. Contamination of animal feces with drug-resistant species can also lead to eventual transmission to humans through soil and water. Overall, this complex web of animal-human interactions leads to transmission of drug-resistant bacterial species into humans. The significant use of antibiotics in food-producing animals as well as the transmission to humans of drug-resistant species is a cause for concern. A study done on the incidence and prevalence of antibiotic-resistant S. aureus on meat and chicken samples in Turkey shows that out of 80 S. aureus strains isolated and identified, 67.5% were found to be resistant to methicillin and 87.5% were resistant to bacitracin. A similar study in the United States examining the colonization of MRSA in swine and swine workers on two large swine production farms illustrated that 45% of the workers were colonized with a MRSA strain which was similar to that found in the swine but different from strains normally found in humans. In fact, many studies done globally have all confirmed that the association between antibiotic use in food-producing animals and the presence of antibiotic-resistant bacterial species from those animals on meat products and in human infections. These facts highlight the key role of antibiotic use in food-producing animals as a major driving force behind the rise in the prevalence of antibiotic resistance. Despite the evidence that antibiotic resistance is a key issue and an emerging global threat, research on new antibiotic medications to combat infectious diseases is slowing down. While the period between the 1950s and 1970s led to discoveries of many new antibiotics from a variety of different classes, no new antibiotic class has been discovered since then. Only 3% of the new medications approved by the FDA between January 1998 to December 2002 were new antibacterials. While there were 19 antibacterial new drug application approvals between 1980 and 1984, there were only six such approvals from 2010 to 2014. 15 of the 18 pharmaceutical companies have left the antibiotic field and the mergers between different companies have diminished the number and diversity of research teams. While the discovery of antibiotics in the early 20th century heralded in the golden age of antibiotic research, currently there are little incentives to continue on the same path. The WHO published a report in September 2017 arguing that the antibiotics currently in clinical development are not sufficient to counter rising antimicrobial resistance, particularly the pathogens with greatest threat to human. The lack of economic incentives and regulatory hurdles are the biggest driving forces behind the lack of novel antibiotics currently. The net present value (NPV) is the measure used by pharmaceutical companies to determine ways to invest money into various projects. The NPV of antibiotics is much lower than other therapeutic classes, especially for noncommunicable diseases, and therefore, antibiotic research is not an economically favorable investment for these companies. The NPV of a medication to treat neuromuscular disease is about $1 billion compared to the NPV of an antibiotic which is only about $50 million according to the Office of Health Economics in London. Antibiotics are used for a relatively short period of time whereas medications for chronic diseases are used for a longer period of time, giving the pharmaceutical companies more economic returns., In addition, many of the existing antibiotics are off-patent and therefore are produced by generic manufacturers. Any new antibiotic would have to compete in the market with generic drugs, which often do work on patients and are less expensive. In addition, new antibiotics are considered to be the last-line drugs, which physicians prescribe as a last resort when older antibiotics do not work, reducing sales for the pharmaceutical company investing in the drug development process. In addition to the lack of economic incentives, there are also much greater risks in antibiotic drug discovery. Bacterial species are continuously evolving in response to the selection pressure placed upon them by the antibiotics, though the time to resistance development is variable. As a result, it is possible that many new antibiotics lead to resistance prematurely, during the clinical trials itself. Regulatory barriers have also led companies away from this area of research. Changing the FDA standards for clinical trials have made antibiotic discovery more challenging. For instance, it is considered unethical to run a placebo-controlled clinical trial and pharmaceutical companies are required to show that the new antibiotic is as efficacious as the older drugs. This requires clinical trials with larger sample sizes and therefore higher costs. Steps are being taken to encourage more research and development in the antibiotic arena. In 2013, the FDA revised its guidelines for clinical trial requirements for acute bacterial skin and skin structure infections, providing more clarity and guidance and helping companies lower costs for clinical trials. The Infectious Disease Society of America has also proposed the limited-population antibiotic drug mechanism which would allow antibiotic approval with smaller clinical trials, lowering costs and time commitments, and address a critical need. With this mechanism, the new antibiotic would be approved for a limited population of high-risk patients. Overall, looking at the current state of the global burden of infectious diseases and antibiotic resistance, it becomes evident that there are multiple driving forces behind the current situation. The results also highlight that there are distinct socioeconomic and political factors leading to antibiotic resistance in developing and developed countries. The primary contributors to resistance development in developing countries include poor surveillance of drug-resistant infections, poor quality of available antibiotics, clinical misuse, and the ease of availability of antibiotics. While similar factors such as self-medication and the lack of regulation on medication imports play a role in developed countries, this is to a much lower extent than in developing nations. In contrast, key contributing factors in developed countries include poor hospital-based antibiotic use regulation and the excessive use of antibiotics in food-producing animals. Finally, there is a decrease in research on novel drugs to continue fighting against infections. In order to combat antibiotic resistance, it is essential to have two key elements: (1) improving the regulatory framework to control antibiotic use globally and (2) promote research on novel antibiotics. It is important to have clear guidelines which are set in place by an International Health Agency, such as the WHO, in order to maintain consistency across nations. However, since each country has a different health care and regulatory system, the specific policies to manage antibiotic use would need to be left to the individual nations. In addition, different aspects of the regulatory system would need to be further improved based on the specific challenges needed to overcome in that country. Whereas in developing countries, the manufacturing process, quality, availability, and use of antibiotics need to be further controlled, in developed nations, hospital-based interventions and antibiotic use in food-producing animals need to be regulated. In addition, further research needs to be promoted in order to develop new antibacterials which can be used in the future. Finally, there also needs to be incentives for nations to adopt a stronger regulatory framework to implement these guidelines. In addition, international agencies should also provide aid for resource-poor countries to develop the necessary infrastructure and to overlook the regulatory processes within each nation. Steps in the right direction are being taken by the WHO currently as they have created a Global Antimicrobial Resistance Surveillance System (GLASS) which collaborates with regional and national antimicrobial resistance surveillance systems to provide comprehensive and timely data. Similar efforts to regulate each of the different contributing factors would help lower the rate of resistance development globally. This study aims to provide a broad overview of the various different factors which contribute to antibiotic resistance globally. 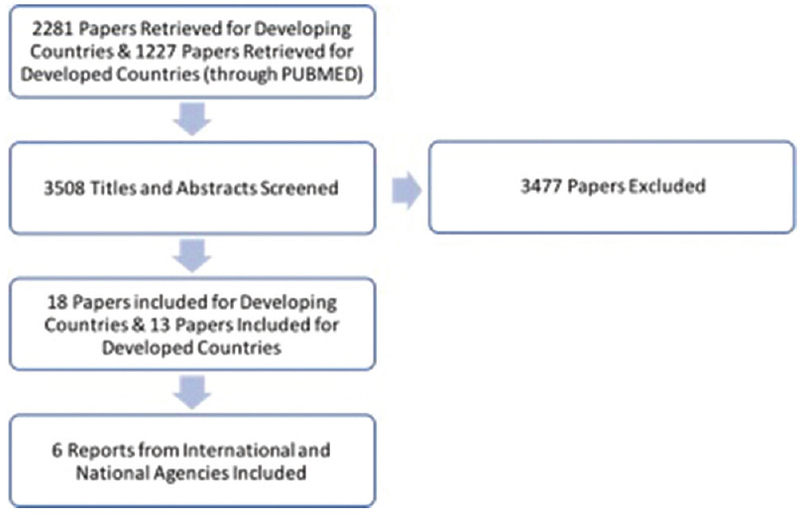 In this review, studies from diverse geographical regions have been analyzed and therefore it helps ensure that the results presented are generalizable to various different developing and developed countries. In addition, reports from national and international agencies have also been utilized to support the findings. Due to the diverse types of research studies utilized in this paper for each of the contributing factors, it is not possible to combine the results into a single statistic. Further research such as a meta-analysis focusing on a single contributing factor may help to combine the results of multiple studies into a single statistic. However, this paper serves as a building block for these further studies. Achievements in Public Health, 1900-1999: Control of Infectious Diseases. Available from: https://www.cdc.gov/mmwr/preview/mmwrhtml/mm4829a1.htm#fig2. [Last accessed on 2017 Feb 22]. The Top 10 Leading Causes of Death in the United States – Medical News Today Available from: http://www.medicalnewstoday.com/articles/282929.php. [Last accessed on 2017 Mar 15]. Conly J, Johnston B. Where are all the new antibiotics? The new antibiotic paradox. Can J Infect Dis Med Microbiol 2005;16:159-60. O'Neill J. Antimicrobial Resistance: Tackling a Crisis for the Health and Wealth of Nations. London, UK: World Health Organization; 2014. World Health Organization | Antimicrobial Resistance: Global Report on Surveillance; 2014. Available from: http://www.who.int/drugresistance/documents/surveillancereport/en/. [Last accessed on 2017 Mar 05]. Reardon S. Antibiotic resistance sweeping developing world. Nature News 2014;509:141. World Health Organization | Global Antimicrobial Resistance Surveillance System (GLASS) Report Early Implementation. World Health Organization; 2018. Available from: http://www.apps.who.int/iris/bitstream/handle/10665/259744/9789241513449-eng.pdf; jsessionid=A32FA92510A66E6B2B337907B4F30C88?sequence=1. [Last accessed on 2018 Jun 19]. Obodozie OO, Mustapha KB, Ebeshi BU, Inyang US. A comparative study on the prevalence of substandard ampicillin/cloxacillin preparations in the Nigerian market: Mid 1990's and present. J Phytomed Ther 2006;11:1-8. [Doi: 10.4314/jopat.v11i1.48619]. Ogunshe A, Adinmonyema P. Evaluation of bacteriostatic potency of expired oral paediatric antibiotics and implications on infant health. Pan Afrs Med J 2014;19:378. doi: 10.11604/pamj. 2014.19.378.2156. Hu S, Liu X, Peng Y. Assessment of antibiotic prescription in hospitalised patients at a Chinese University hospital. J Infect 2003;46:161-3. Gani L, Arif H, Widjaja SK, Adi R, Prasadja H, Tampubolon LH, et al. Physicians' prescribing practice for treatment of acute Diarrhoea in young children in Jakarta. J Diarrhoeal Dis Res 1991;9:194-9. StopTB Partnership. Out of Step 2015 TB Policies in 24 Countries A Survey of Diagnostic and Treatment Practices; 2015. Available from: http://www.stoptb.org/assets/documents/news/report_out_of_step_2015_11_pdf_with_interactive_links.pdf. [Last accessed on 2018 Jun 25]. Achanta S, Jaju J, Kumar AM, Nagaraja SB, Shamrao SR, Bandi SK, et al. Tuberculosis management practices by private practitioners in Andhra Pradesh, India. PLoS One 2013;8:e71119. Dancer SJ. The dangers of broad spectrum antibiotics. BMJ 2003;326:1111. Ab Rahman N, Teng CL, Sivasampu S. Antibiotic prescribing in public and private practice: A cross-sectional study in primary care clinics in Malaysia. BMC Infect Dis 2016;16:208. Ecks S, Harper, Ian ND. There is no regulation, actually: The private market for anti-TB drugs in India. In: When People Come First: Anthropology & Social Innovation in Global Health. Durham, NC: Duke University Press; 2013. Dooling KL, Kandeel A, Hicks LA, El-Shoubary W, Fawzi K, Kandeel Y, et al. Understanding antibiotic use in Minya district, Egypt: Physician and pharmacist prescribing and the factors influencing their practices. Antibiotics (Basel) 2014;3:233-43. Satyanarayana S, Kwan A, Daniels B, Subbaraman R, McDowell A, Bergkvist S, et al. Use of standardised patients to assess antibiotic dispensing for tuberculosis by pharmacies in urban India: A cross-sectional study. Lancet Infect Dis 2016;16:1261-8. Kashyap RS, Husain AA. Over-the-counter drug distribution and tuberculosis control in India. Lancet Infect Dis 2016;16:1208-9. Team CD. Chennai Declaration: 5-year plan to tackle the challenge of anti-microbial resistance. Indian J Med Microbiol 2014;32:221. Cousins S. Healing India's Traditional Healers [WWW Document]. The Development Set; 2016. Available from: https://www.thedevelopmentset.com/healing-india-s-traditional-healers-31f55fc9749b. [Last accessed on 2017 Mar 11]. Mohanan M, Vera-Hernández M, Das V, Giardili S, Goldhaber-Fiebert JD, Rabin TL, et al. The know-do gap in quality of health care for childhood diarrhea and pneumonia in rural India. JAMA Pediatr 2015;169:349-57. Planta MB. The role of poverty in antimicrobial resistance. J Am Board Fam Med 2007;20:533-9. Macias EP, Morales LS. Crossing the border for health care. J Health Care Poor Underserved 2001;12:77-87. Richman PB, Garra G, Eskin B, Nashed AH, Cody R. Oral antibiotic use without consulting a physician: A survey of ED patients. Am J Emerg Med 2001;19:57-60. Weinstein RA. Controlling antimicrobial resistance in hospitals: Infection control and use of antibiotics. Emerg Infect Dis 2001;7:188-92. MacDougall C, Polk RE. Antimicrobial stewardship programs in health care systems. Clin Microbiol Rev 2005;18:638-56. Centers for Disease Control and Prevention. Percent of Hospitals with Antibiotic Stewardship Programs by State, 2014. Centers for Disease Control and Prevention; 2014. Landers TF, Cohen B, Wittum TE, Larson EL. A review of antibiotic use in food animals: Perspective, policy, and potential. Public Health Rep 2012;127:4-22. SUMMARY REPORT on Antimicrobials Sold or Distributed for Use in Food-Producing Animals. Food-Producing Animals; 2016. Gundogan N, Citak S, Yucel N, Devren A. A note on the incidence and antibiotic resistance of Staphylococcus aureus isolated from meat and chicken samples. Meat Sci 2005;69:807-10. Smith TC, Male MJ, Harper AL, Kroeger JS, Tinkler GP, Moritz ED, et al. Methicillin-resistant Staphylococcus aureus (MRSA) strain ST398 is present in Midwestern U.S. Swine and swine workers. PLoS One 2009;4:e4258. Ventola CL. The antibiotic resistance crisis: Part 1: Causes and threats.PT 2015;40:277-83. World Health Organization | ANTIBACTERIAL AGENTS IN CLINICAL DEVELOPMENT An Analysis of the Antibacterial Clinical Development Pipeline, Including Tuberculosis. World Health Organization; 2017. Available from: http://www.apps.who.int/iris/bitstream/handle/10665/258965/WHO-EMP-IAU-2017.11-eng.pdf; jsessionid=F9C30889A3920B7D0154788F545E7E88?sequence=1. [Last accessed on 2018 Jul 09]. Mossialos E, Morel C, Edwards S, Berenson J, Gemmill-Toyama M, Brogan D. Policies and Incentives for Promoting Innovation in Antibiotic Research. Copenhagen, Denmark: European Observatory on Health Systems and Policies; 2010. Bartlett JG, Gilbert DN, Spellberg B. Seven ways to preserve the miracle of antibiotics. Clin Infect Dis 2013;56:1445-50.